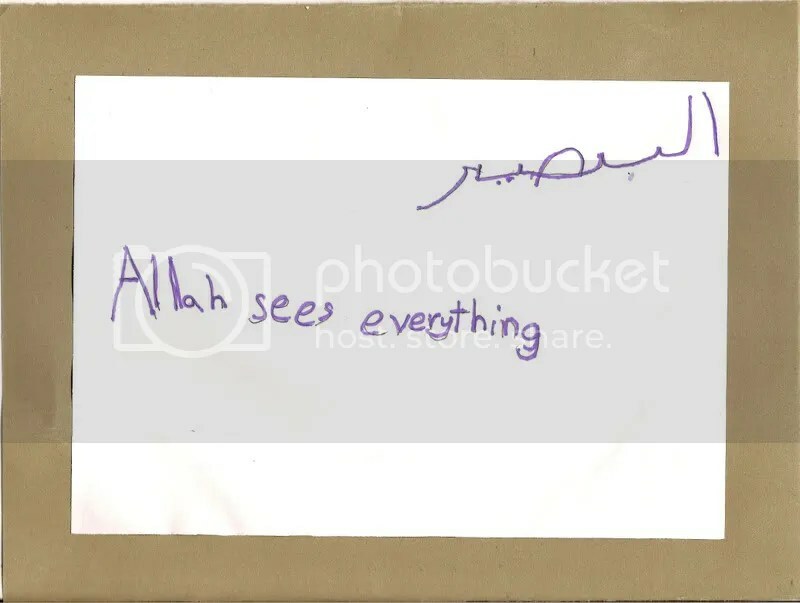 Allah is The One whose insight sees all things clearly, both the apparent and the hidden. The One who perceives every detail. This Attribute means that Allaah Sees and Is aware of everything that happens, no matter how small or minute it is, even if it is hidden. I gave examples of doing good deeds. I think it is important to highlight about good deeds more than bad deeds sometimes. I am trying to make them more aware that Allah loves good deeds rather than punishing. I want them to know that even the littlest good deed does not pass the eyes of Allah. Linking back to lesson we learnt earlier Allahu A’lim, Allah knows when we even have good intentions in our heart and even the littlest intention will be rewarded and extra rewards will be given when we actually implement the good deed. I also want them to know that knowing that Allah is Al Baseer, we do not have to prove it to anyone else that we have done something good. Knowing that Allahu Alim and Allah AlBaseer should be a comfort to us that he knows and He sees and it will be recorded. Allah also sees our future and know what we do not know. Knowing this meaning, makes a person fear Allah and be conscious of Him in private and public and in all affairs, and become shameful to be seen by Allah committing sins. According to the fatwa HERE The Name Al-Baseer is mentioned 62 times in the Quran. Allaah Knows best. Then we listened to the nasheed by Yusuf Islam and friends. Arkan Al Islam. Listen to the excerpt HERE. H : h is now reading up to Juz 12. He is reciting AlQuran with an Indonesian Ustaz at one of the mosques nearby. He has also memorised up to AlBayina. However I am now making him repeat all the ayahs that he has memorised to check on his tajweed. The Ustadz is also doing the same. Insya Allah. B : She is now reading the first page of Iqra 6. However, I have also started making her recite the Juzzu Amma especially on the soorahs that she has memorised. This is in the hope that as soon as she finishes her Iqra 6, she can fluently recite the alquran. She has also memorised Al Fatihah up to Almasad. We skipped An Nasr and go straight to Al Kafirun, Al Kawthar (because it is short and will boost her confidence) and Al Qadar (because we did the Ramadhan activity). She has also memorised ayatul Kursi, Alhamdullilah. And we have been making it a routine of reciting the 3 Quls and ayatul Kursi before going to sleep. 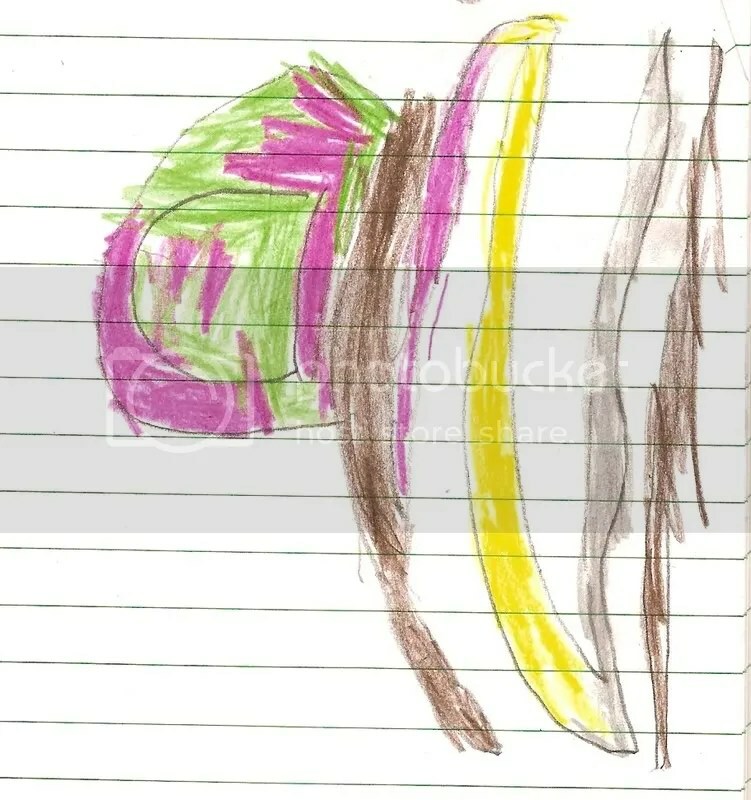 This helped her memorisation better. Z : He is now staring on Iqra 1 and is on the letter ‘ro’. He is sometimes caught memorising a bit of Alfatihah, a bit of Annas, abit of alikhlas and a bit of ayatul kursi. Bless him. This week we discusses ayatul Kursi. While Al Ikhlas is the greatest soorah. Then I proceeded by describing the general meaning of the ayah. 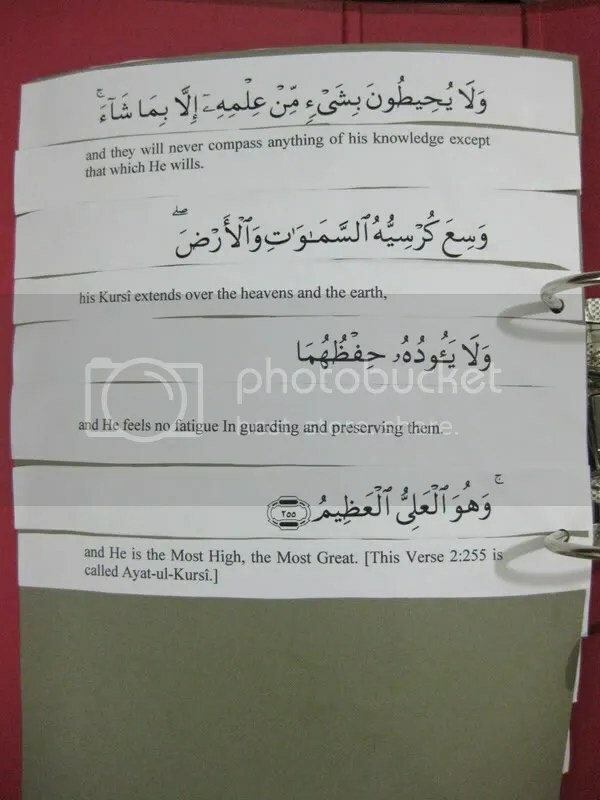 The reason why Ayat al-Kursi is the most excellent verse, is that this verse mentions the names of Allah Most High more than any other verse (i.e. this verse contains the most remembrance (dhikr) of Allah Most High). (Al-Hayyul-Qayyum) testifies that Allah is the Ever Living, Who never dies, Who sustains everyone and everything. All creation stands in need of Allah and totally relies on Him, while He is the Most Rich, Who stands in need of nothing created. means, no shortcoming, unawareness or ignorance ever touches Allah. Rather, He is aware of, and controls what every soul earns, has perfect watch over everything, nothing escapes His knowledge, and no secret matter is secret to Him. Among His perfect attributes, is the fact that He is never effected by slumber or sleep. This is important for Muslims to remember that Allah never tires..for in the bible it says that God created everything in 6 days and rests on the seventh. While Allah says in Quran, that no slumber or sleep overtakes Allah. indicates that everyone is a servant for Allah, a part of His kingdom and under His power and authority. this refers to His perfect knowledge of all creation; its past, present and future. asserts the fact that no one attains any part of Allah’s knowledge except what Allah conveys and allows. This part of the Ayah indicates that no one ever acquires knowledge of Allah and in His Attributes, except what He conveys to them. His Kursi extends over the heavens and the earth. meaning, it does not burden or cause Him fatigue to protect the heavens and earth and all that is in between them. Rather, this is an easy matter for Him. Further, Allah sustains everything, has perfect watch over everything, nothing ever escapes His knowledge and no matter is ever a secret to Him. All matters are insignificant, modest and humble before Him. He is the Most Rich, worthy of all praise. He does what He wills, and no one can ask Him about what He does, while they will be asked. He has supreme power over all things and perfect alertness concerning everything. He is the Most High, the Greatest, there is no deity worthy of worship except Him, and no Lord other than Him. 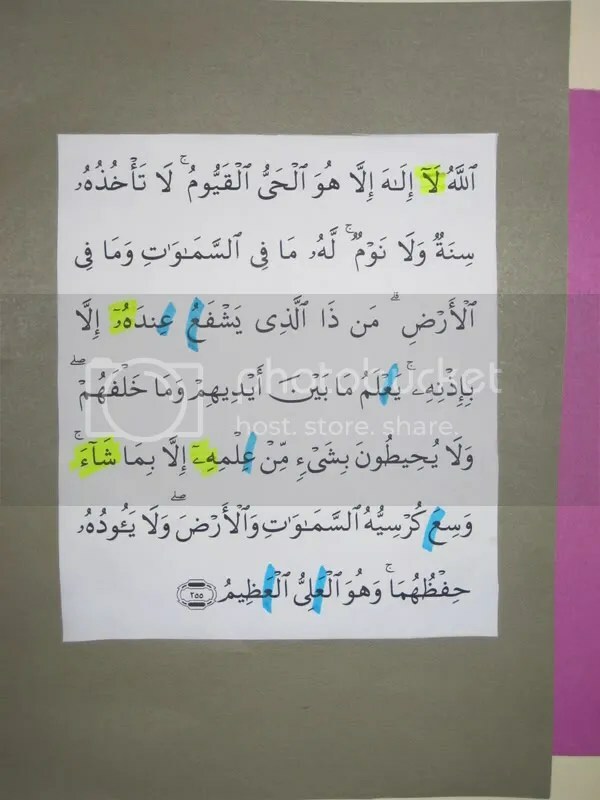 I printed Ayatul Kursi and cut it as according to each waqaf. B then arranged it accordingly leaving space between one waqaf and another. H task was to put the respective translation which I have printed and cut accordingly. Prior to this, I will highlight some arabic words in the ayah. This helped him understand the translation of the verse. 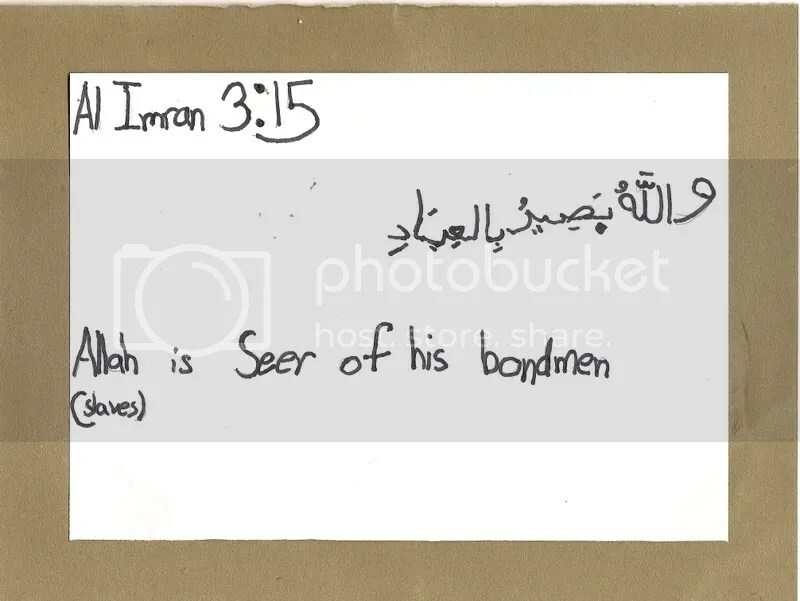 Also helped him identify more arabic words particularly the words which are repetitive in the Quran. Z also wanted to be a part of this activity. I pointed to him the word Allah in the verse and later asked him to point out the word Allah. He was very happy. I also pointed to him the letters that he know (which are not in its connected form in the verse) like dzal, alif and rho. He sure felt accomplished! By discussing this ayah, i get to zoom in their mistakes in memorising this verse. And I corrected them. In fact I had it printed out and highlighted their clearest mistake which were mainly the long mad and pronunciation of the letter “ain”. Now we have the printed verse on their wall and will be reviewed everyday before sleep until I am happy with their recital, Insya Allah. This is one of the manners that can be easily taught as first of all everyone needs to eat. And thus since it is also a family activity, observation can be made whether they are living the lessons they learnt. There are some parts about eating manners which are hard to do sometimes. Particularly the eating too much. Especially when you are invited to people’s house. It is very difficult to not eat a lot in most malay’s household. Either the food is too good or they’d pester you to eat more. May I walk the talk myself. Insya Allah. My syllabus for this topic was mostly taken from TJ on adabs of eating. Masya Allah. She has made such resourceful site. Very useful for those who want to teach their children Islam like myself. May Allah bless her for her great work. If you would like to read her notes on Etiquette & Manners : Eating, just click HERE. What would happen if we do not say Bismillah? Then the shaytan will eat with you. We do not want to be feeding shaytan now do we? Oh No! I forgot to recite Bismillah. What should I do now? What do you say when you have finished eating? Now, what should we do with the dishes after we finished eating? – Sya to wipe and sweep the table and floor. More Manners of eating : Some are not necessarily from sunnah but are still in accordance to good manners. This is one of the perhaps most difficult thing to do. Thus if we are the host, we should make the dish easily accessible on the table to everyone. Activity for Zachary : To trace his right hand on a paper and labeled I eat with my right hand. Which hand is my right hand? It’s sometimes hard to know. That I will share and show. Put both hands out in front of you. Then it is easy to tell. It was a habit of Rasullullah S.A.W. to eat only with three fingers. Although there are in narrations that he eats with five too. The benefit is so that one will not eat too much. And this is the wisdom of licking the fingers after eating. Because we do not know where the barakah in our food lies. Ibn Ka’b b. Malik reported on the authority of his father that the Messenger of Allah (may peace be upon him) used to eat (food) with three fingers and he licked his hand before wiping it (with towel). Sometimes we do eat with utensils. Take care that we do not eat with our left hand for eating with for and knife, often requires us to cut with right hand, and to eat with the left. To take good care of our teeth, we should rinse our mouth every time we eat. This is probably one of the hardest sunnah to follow among the sunnah of eating. especially now when we have so many invitations are good eateries. Too much delicious food! May I be able to follow through, Insya Allah. Do not criticise food. If you don’t like it, leave it. This shall serve as a reminder for me not to criticise food that I don’t find pleasure in it. If the iqama is called, and your food has been served, eat first before praying. This however, my children, does not apply if you are only going to pray when the praying time is nearly over. This usually happen as for they come home (from school) hungry but yet they have not prayed Dzuhur. Pick Back the food you drop, clean it and eat it. Jabir r.a. reported that : I heard the Messenger of Allah s.a.w. saying :’Satan attend to all your affair, even your food. When some of teh food falls on the ground, one should remove the soiling from it and then eat it. He should not leave it to Shaytan. When you finish eating, lick your fingers, because no one knows (in which spot the plate) the (blessing of Allah) is. As this is the topic for the class, we have been reminding each other about the manners of eating and drinking. Among them are reciting Basmallah, eating with right hand and licking the fingers. I also reminded them to chew slowly and to not eat too fast.